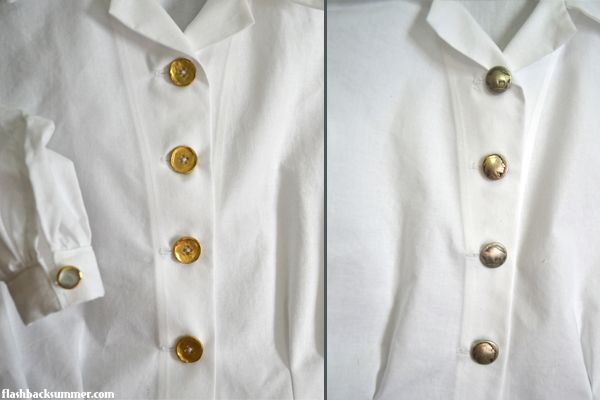 I especially love this blouse because it has pleats and darts at the waist... and that's it. There are no darts for the bust area. It is a looser fit, but I like the lack of darts because it allows me to switch between vintage and modern shaped bras and the blouse still looks right. Not to mention the loose fit is entirely 1940s, since they seemed to have more ease in their tops than we prefer these days. 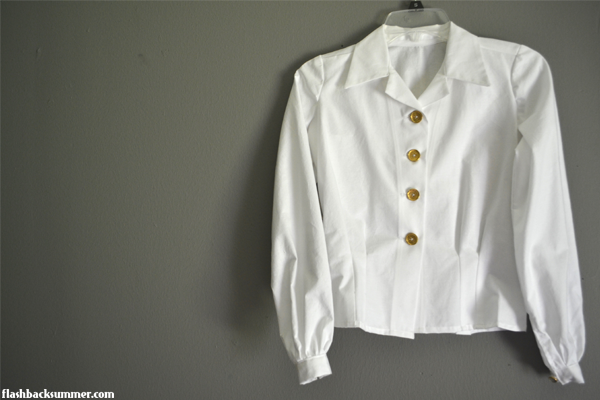 I love this blouse so much, in fact, that in addition to the three versions I've shown here on my blog, I also made three others to use as work blouses. My job requires a white shirt with a collar, so this pattern worked perfectly. However, I made the blouses out of a cheaper bleached muslin just to get me by when I started the job and was transitioning from office wear. They have since been washed and worked in repeatedly and are starting to look raggedy. So, when I went to my grandma's house for vacation a couple weeks ago I recruited her to help me! My grandma started sewing after she got married to make things for her kids, and she is brilliant at what I call "factory sewing," or sewing lots of one thing all at once. 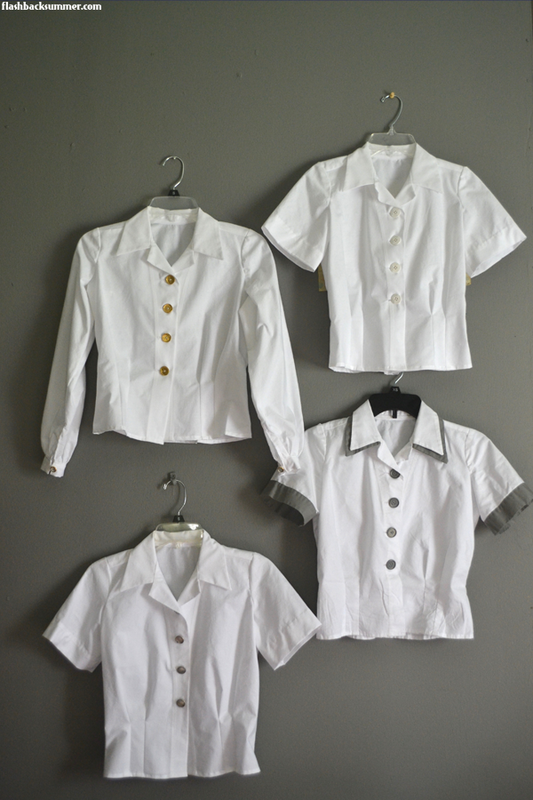 I cut out pieces for four work blouses, and she and I finished them in about a day by working together. When one of us sewed, the other would press, and when one of us was better and doing a certain part of the garment, we'd work on that part while the other person prepped the next step. It worked wonderfully! Since I'm a bit of a rebel and need SOME sort of variety in my clothing, I did little tweaks to make each blouse unique. (This is a great tip if you have wardrobe guidelines at your job like I do. Just work in what you can to make pieces unique.) I chose fun buttons for each in completely different colors. 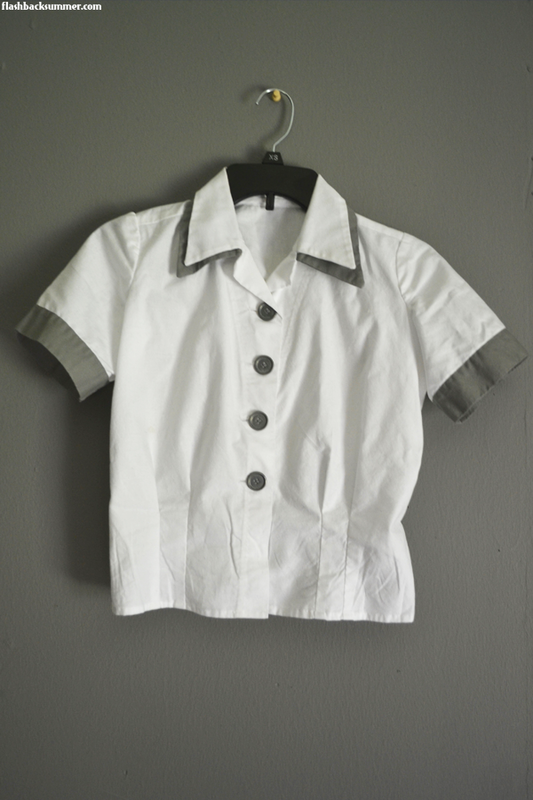 I made three short-sleeved and one long-sleeved for the heck of it. 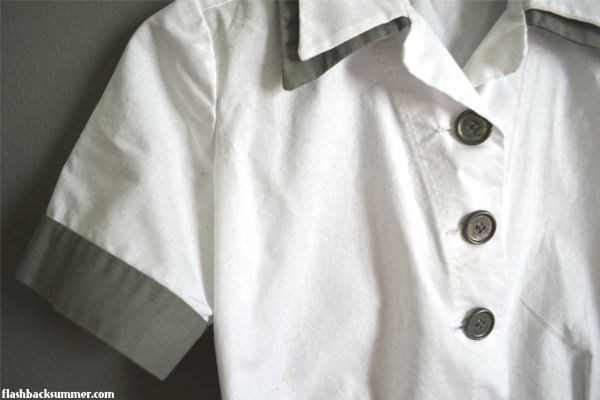 I also did a double collar and contrast cuffs on one of the shirts in gray to coordinate with its pewter-colored buttons. This was also my first time working with Kona cotton... and I see what all the fuss is about. 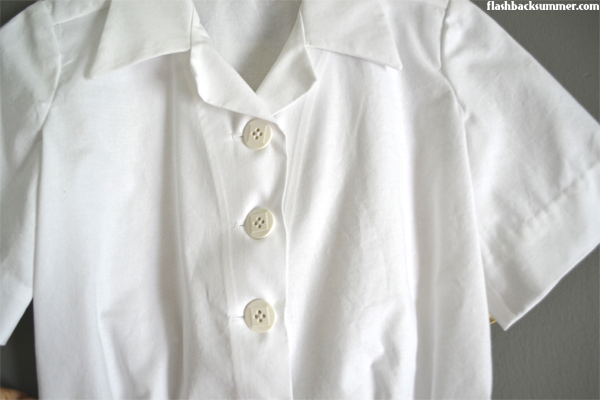 It's much thicker and more opaque than other cottons I've worked with, which makes it lovely for white blouses. (With skin-colored undergarments they don't require an undershirt for modesty.) It's great to work with and it doesn't wrinkle much when I wear them. My job has a lot of moving and lifting, so that's an impressive thing! The last adjustment I made to this pattern since my last version was to increase the armscye just a tiny bit. I did a flex-sleeve pattern hack the Boyer Sisters shared on their blog to help me with arm mobility at my job (lifting, like I said), and it has made a huge difference. I rounded out the tutorial's suggested armscye shape to avoid a sharp corner under the arm, and now I have full range of movement and my shirt stays tucked all day! I absolutely love it, and now other sleeves feel positively constricting. I don't think I'll sew a normal one ever again. You'll be seeing these blouses again. There's nothing like a crisp, white shirt! Do you have any work wardrobe requirements? How do you work with them to still express your personal style, if possible? Have you ever done "factory sewing" for your own wardrobe? These shirts have come out beautifully! Definitely can't beat a crisp white shirt!! wow, I am so impressed, well done! That sounds like so much fun- factory sewing with your Grandma. I used to work in a job that required black, and it was the same thing with me- make each garment a bit more interesting and add details. You don't have to wear boring t-shirts! These bloused turned out really nicely- good job! So true! Dress it up a little. Thank you! 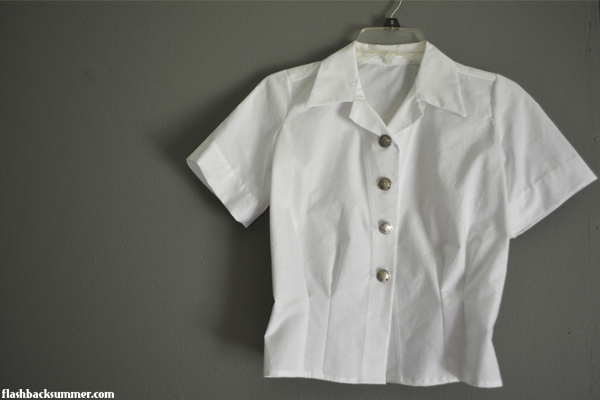 Your blouses are lovely & factory sewing is my favorite way to get things sew for myself! My one of my jobs requires me to wear all black, so I drafted a pair of 1930s beach pajama inspired, super wide-legged pants from a black linen/rayon. They are some of my favorite pants & I get lots of compliments on them. Thank you for sharing this. Your blog is inspiring to me. Oooo, those pants sound awesome! And I'm glad to hear you're inspired! That's encouraging. I'm with everyone else - there is something so satisfying about a crisp white shirt! They look really great, and I love the variations. Also, how exciting to have a pattern that you have perfected so completely. That must feel really wonderful! I am glad you are impressed with Kona cotton. My Mom dragged me over an hour to Amish country to buy cheap Kona cotton and it felt like a little over kill. But my mother has aways gotten nice fabric so I tend to not know what to compare the good stuff to. Oodles of high fives! That's awesome! Your shirts are terrific. So classic, versatile and lovely. What great shirts! I love the darts and the color contrast you added on one. Fabulous! I have one white shirt, it's a wrap one, is so beautiful, but it creases horribly when hanging in the wardrobe, almost like it demands to be hung alone. High maintenance in more ways than one! Ah man, what a bummer! I have some pieces like that, but they're worth the effort every once in a while!